With no less than five temperature probes and five fan controllers the NZXT Sentry LXE sets itself up to be the environmental control centre for your PC. With so many controllers on the market, its main gambit is a flashy touchscreen desktop control unit, this connects to a fan controller card installed in a spare backplate slot – though no PCI slot is actually required for it to work. 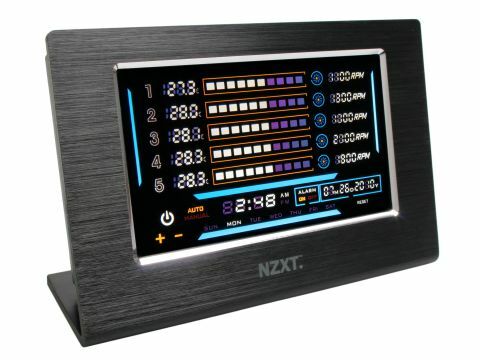 The NZXT Sentry LXE then provides a complete environmental breakdown of the five thermocouple temperature sensors and controls for the five three-pin fan power channels. The fan controller works in two modes, either fully automatic where it tries to maintain a temperature with an upper threshold alarm, or a manual mode where you directly set the fan speed. The five-inch touchscreen provides all the controls you need to set temperatures and fan speeds, along with a date and time display.